A Terry Symmetry frame, built up to my specifications. About 8 years ago I bid on a NOS 1990’s Terry Symmetry steel frame on eBay. I was at that time searching for the perfect bike to fill the gap left by my crashed (in 1999) 1976 Centurion Pro Tour. I had purchased and ridden quite a few bikes since then, but none of them “took”. 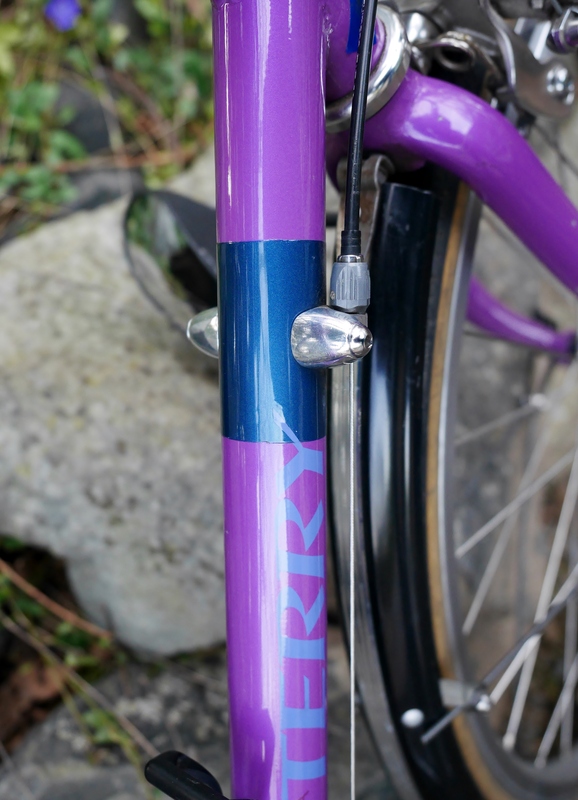 I won the auction for the Terry frame, but when it arrived, I saw that one of the downtube shifter bosses was damaged, and perhaps that was why the frame had never been built. The seller was shocked that he hadn’t noticed this, and he reimbursed me for the costs I incurred to have the frame repaired. 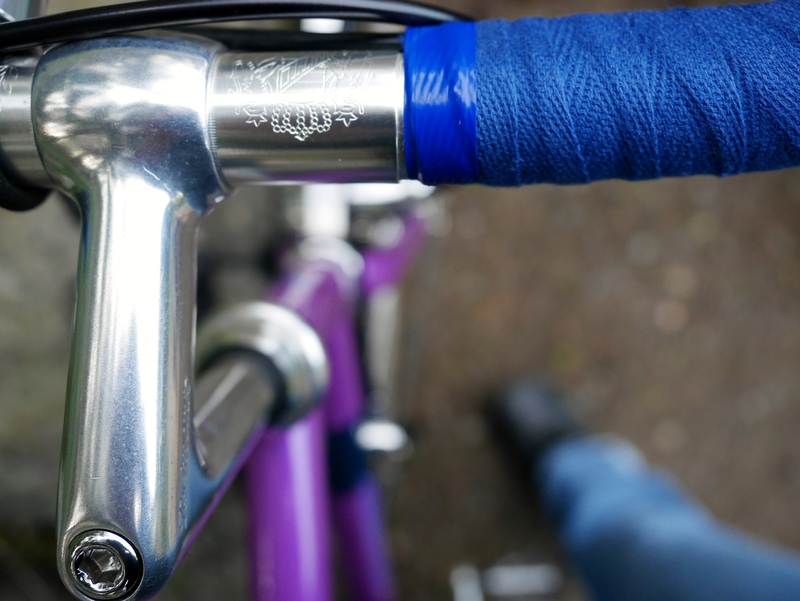 I took the frame to Oregon Manifest winner Tony Pereira, who re-brazed a new downtube shifter boss. 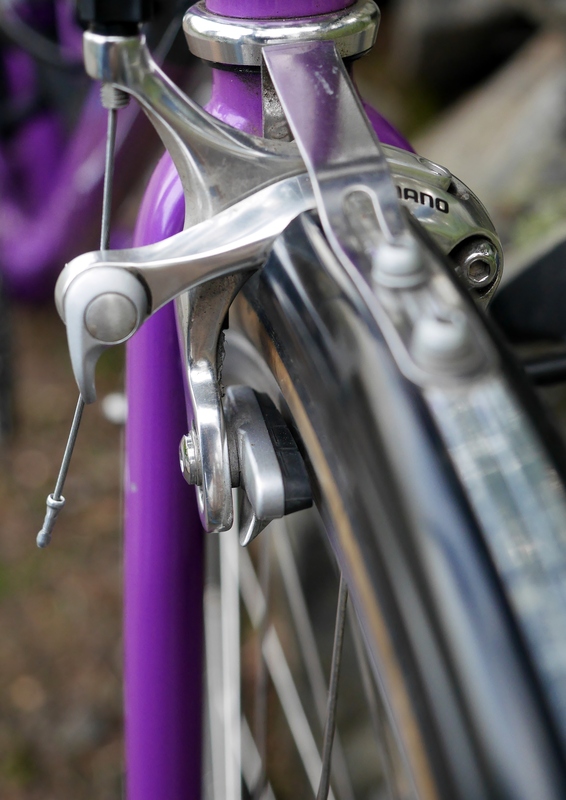 That involved removing the existing lavender sparkle paint in the immediate area around the shifter braze-ons. His painter was not able to match the paint exactly, so instead came up with the perfect solution of using an accent color. You can see in the above photos the new blue accent color and the perfectly executed hand-lettering of the Georgena Terry logos. Now my Terry frame sports a custom paint job! If we use the term “womankind” to signify all human beings, as is always done with the term “mankind” then we would have bicycles sized for such beings – who are on average about 5’4″ in height. Such bicycles would have appropriately sized wheels (probably 26 inch or smaller), and bicycle frame geometry would reflect the correct dimensions of such a human. 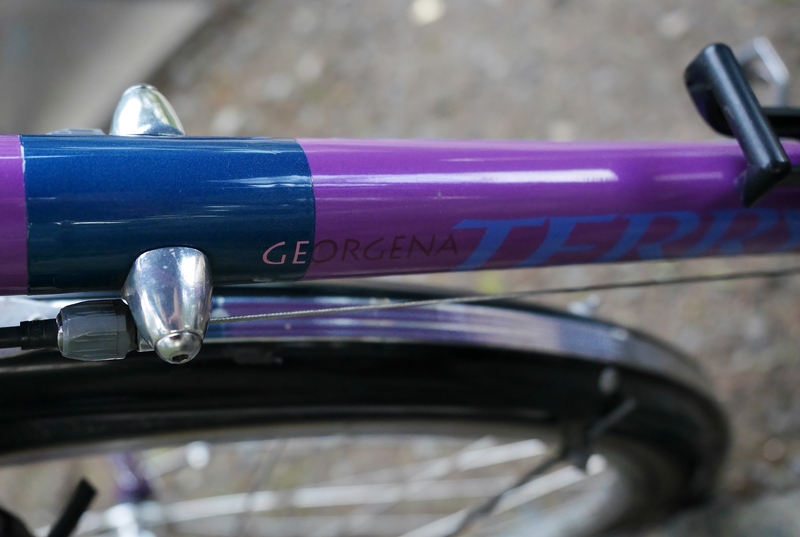 Georgena’s initial frame geometry solution was to keep the big 700c wheel at the back, which was the industry standard at the time, and to use a smaller wheel on the front – a 24 incher. This meant that the steel frame for the rider could be quite large, with a hefty headtube, but still be “as fast” as any other bike out there due to the 700c rear wheel. While I am one of those cyclists that prefers the look of a bicycle with the same sized wheels front and rear, this design proved wildly successful and womankind was pleased, as finally they had bikes to fit their bodies. Since then, Georgena has researched the anatomy and physiology of women riders, and has incorporated her findings into her latest endeavor: Hand built steel bicycles – both custom and off the shelf, built by Waterford and engineered by Georgena, having sold her interest in Terry Precision Bicycles back in 2009. All of the bikes she builds now feature the same sized wheels front and rear (559s usually), plus many frames designed with a sloping top tube. They are typically built with Waterford OS2 double butted steel. Her bicycles have some unique characteristics: large head tube, very little BB drop, steep seat tube angle, slack head tube angle, vertical drop outs, long chainstays, and minimal fork rake. Some of these characteristics are not necessarily what I seek in a bike frame, yet the Terry Symmetry that I ride regularly is one of my most comfortable and treasured bicycles! One of my theories about this bike’s amazing comfort is the large head tube – made possible by the almost negligible bottom bracket drop of 35 mm. 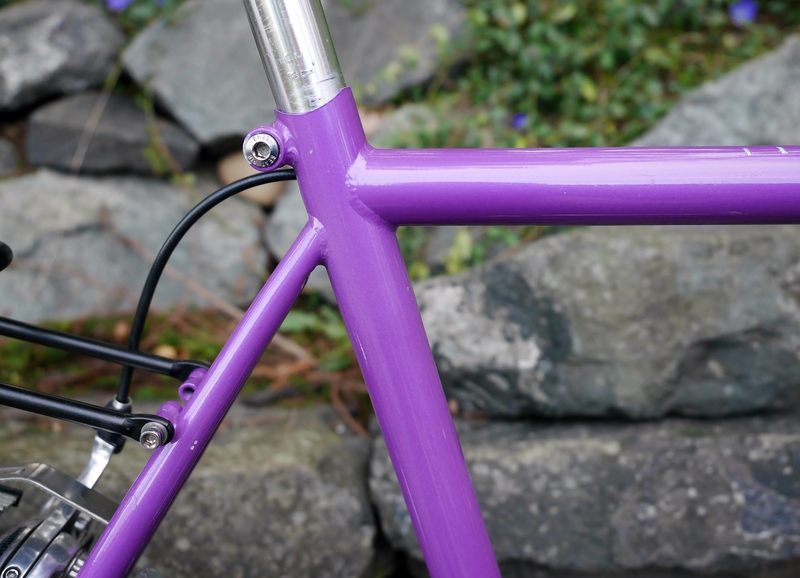 The frame is “square” meaning that the seat tube and top tube are the same length – 51 cm. With the minimal drop, there’s a high bottom bracket -about 28 cm. You’d think I would hate this frame, but instead, having all that steel (Tange tubing which is TIG welded) under me helps to absorb road shock, and is much more flexible than a smaller frame would be. The frame is a bit tall for me – but, who cares? I often ride pretty tall frames. 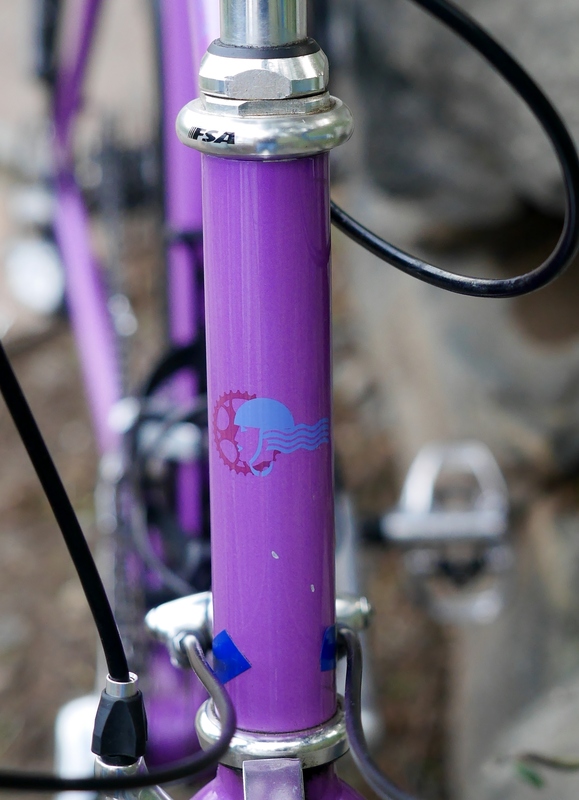 The most important measurement for frame comfort is the top tube. In this case, it’s only 51 cm – much shorter than many “smaller” frames, and that’s why I feel so relaxed on this bike – my hands naturally connect with my Nitto Rando bars with no effort at all. I set this bike up with some of my favorite components: Shimano bar end shifters, Shimano side pull brakes, Shimano brake levers, and my 1984 Shimano 600 crankset and front derailleur (taken off my old Davidson) which apparently will never wear out! I ordered a Harris custom 8 speed cassette after riding the bike for a while with an off the shelf unit. I built the wheels myself (Mavic X221 32 hole rims on Shimano hubs), converting the bike from its original 650c wheel size to 559, and after years of service my wheels have never gone out of true. Because this bike has minimal clearance (it was built in the sad “racing” days of yore), I needed to mount my fenders over the top of the fork and rear brake bridge. I cut up an ancient Bluemels fender set which was pretty long in the tooth. But, the fenders are holding up well. 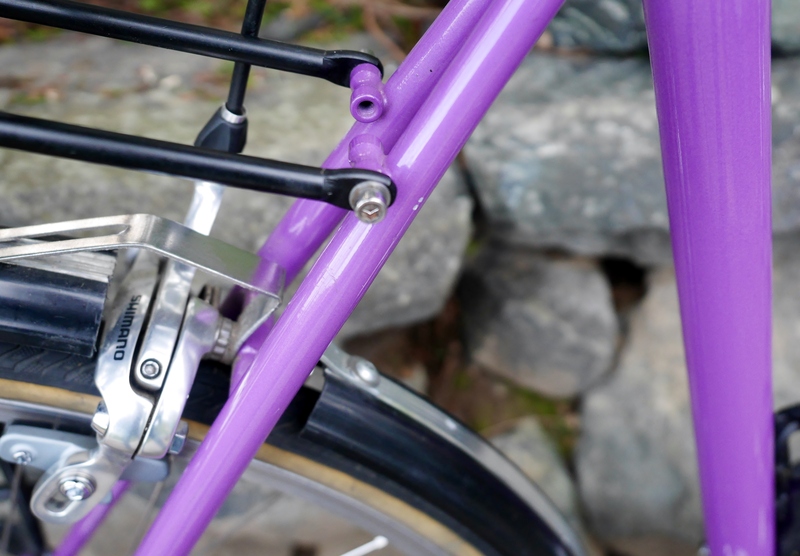 Recently, I switched out my p-clamps on the front fork (which had no eyelets), for a Velo Orange fender bracket. The bracket cleans up the look on the front end, but makes front wheel removal much more finicky. 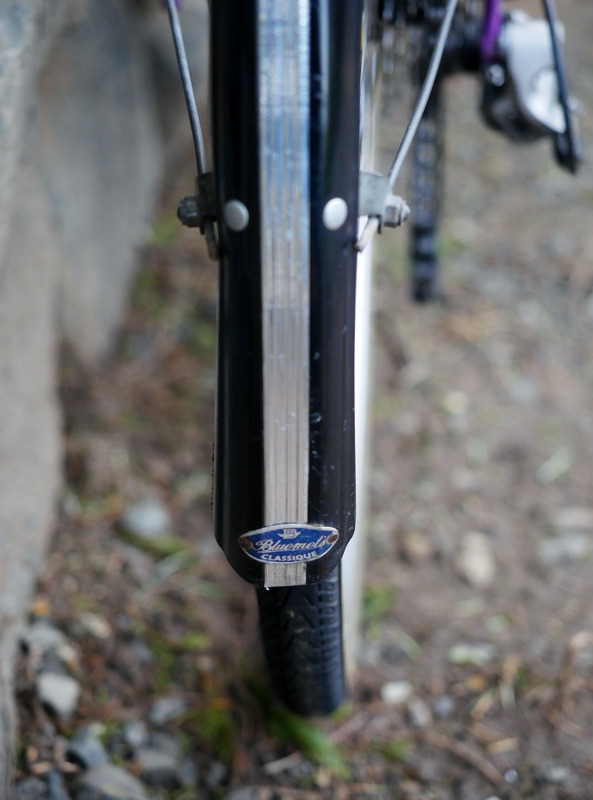 I use Panasonic Panaracer Tourguard folders on this bike which have been comfortable and reliable. 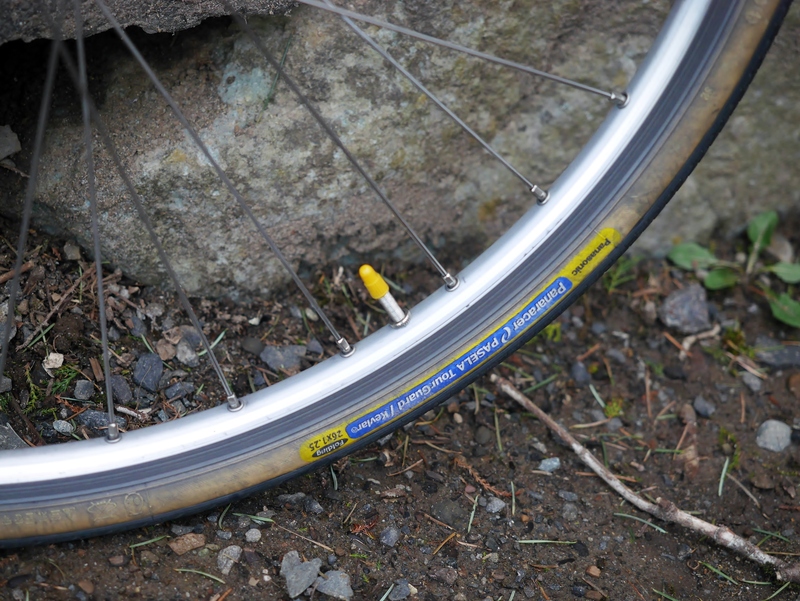 Georgena Terry is now recommending Compass Elk Pass 559 Road Tires for her bikes (also made by Panasonic), so I may try those out whenever the Panaracer’s wear out. But, meanwhile, I will continue to enjoy this wonderful bicycle which I always look forward to riding. 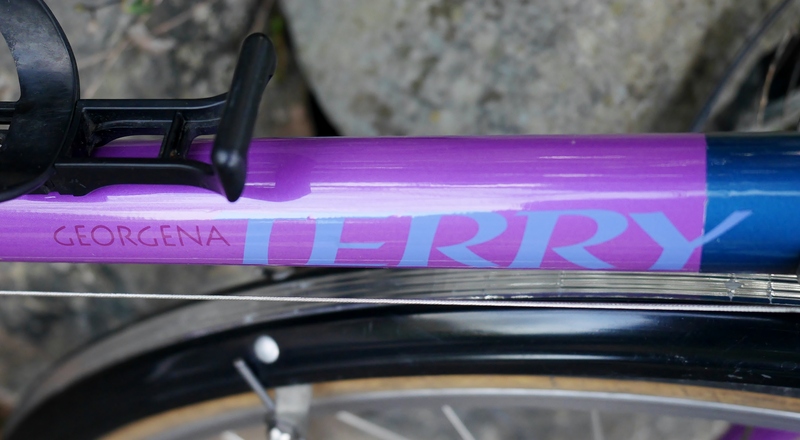 This entry was posted in Bicycle restoration, Commuter bicycle, Terry, Terry Bicycles and tagged Georgena Terry, Terry bicycle by Nola Wilken. Bookmark the permalink. It’s a nice looking bike. Nice to see (559) 26″ wheels used. I wish the bike industry would make smaller frame road bikes with 559 wheels. 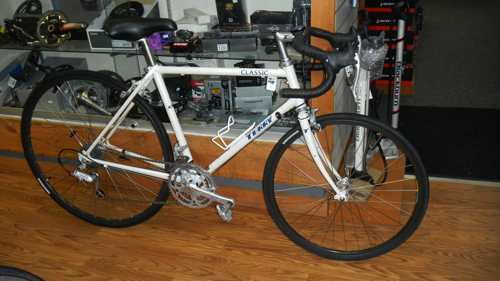 I have two bikes with 26″ wheels, an old 1993 Trek 950 with Pasela 26″ x 1.75 folding tires. I put on drop bars years ago and it rides nice. 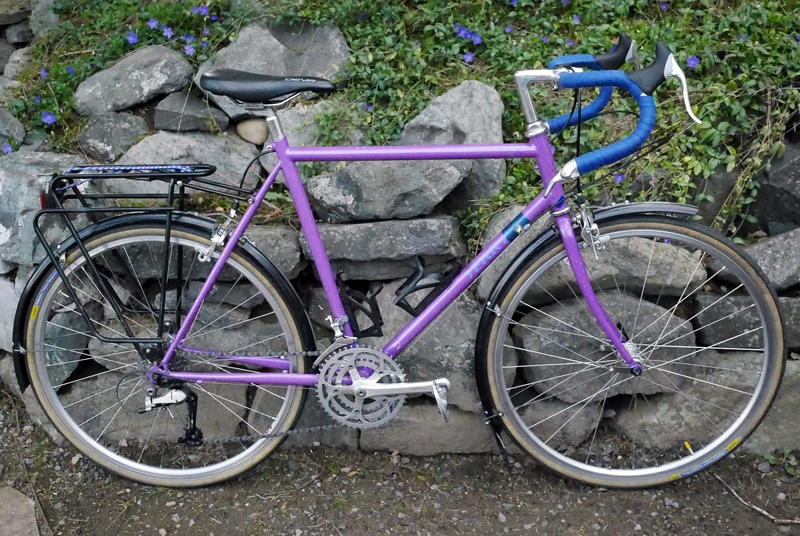 It is my main commuter and touring bike for over 20 years. Two years ago I bought a VO Campeur frame and fork and I built a set of 26″wheels with dynohub. Another very versatile bike. 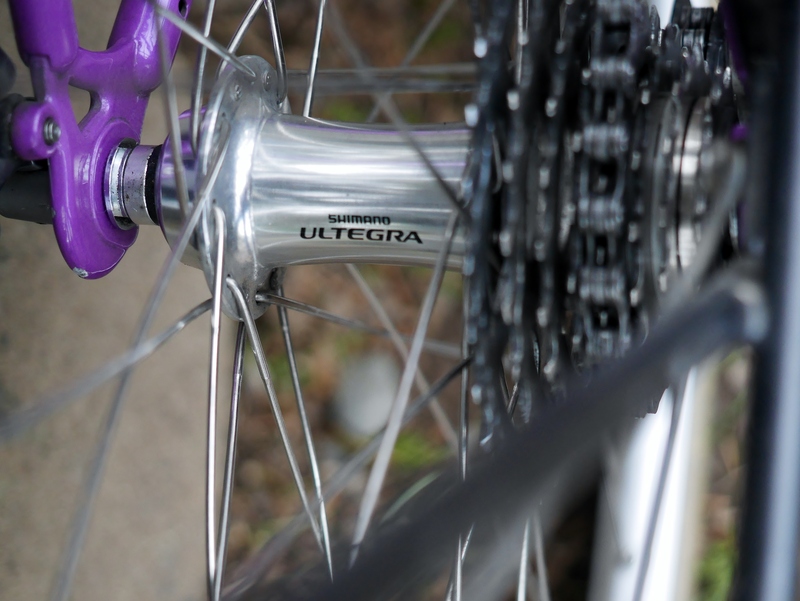 26″ wheels provides shorter riders so much more space compare to a 650b or 700c. I have those too so I know. I couldn’t agree more! When I built my one and only frame in a UBI class, I chose to build it for 650b, but in retrospect wish I had chosen 559s. Pretty bike. Nice story too. I picked up a 2000 Symmetry today, saving it from the trash at the LBS. I will change the wheels from 571 to 559. Which model of brakes did you use please. Hi Ken, congrats on your find. 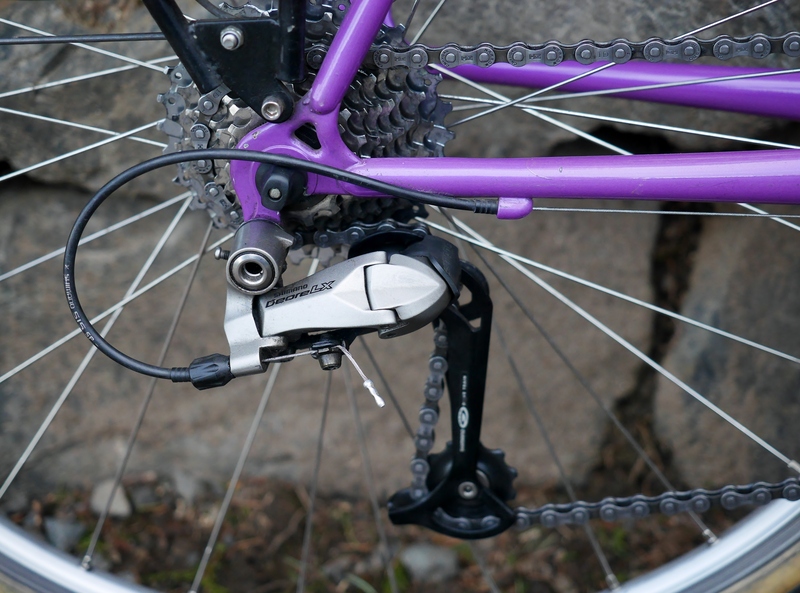 I used Shimano medium reach calipers to make the conversion to 559s. What a nice bicycle! I have seen Terrys with the big wheel in the back and I never liked it, but I knew she also moved on to same sized wheels. This bicycle looks proportionate the way my husband’s bicycles are. My bicycles have 700cc wheels and are tiny frames which is so wrong. I agree that top tube length is most important and I have realized the shorter the better! 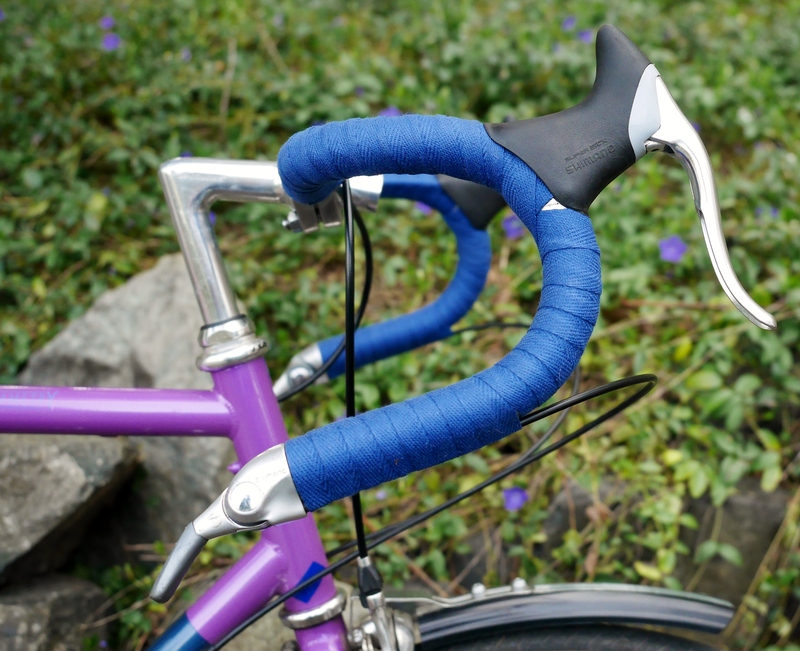 My main year round bicycle has a slightly longer top tube and I find it too long, especially with the longer than I like gorgeous 3T stem that came with the bike. I was given a vintage bianchi that is almost square. I seat tube makes the bicycle too big for me to stand over so I’ve never even ridden it. But the top tube is less than 50cm! So I will rebuild with smaller wheels. I am unsure about 650b or 650c. 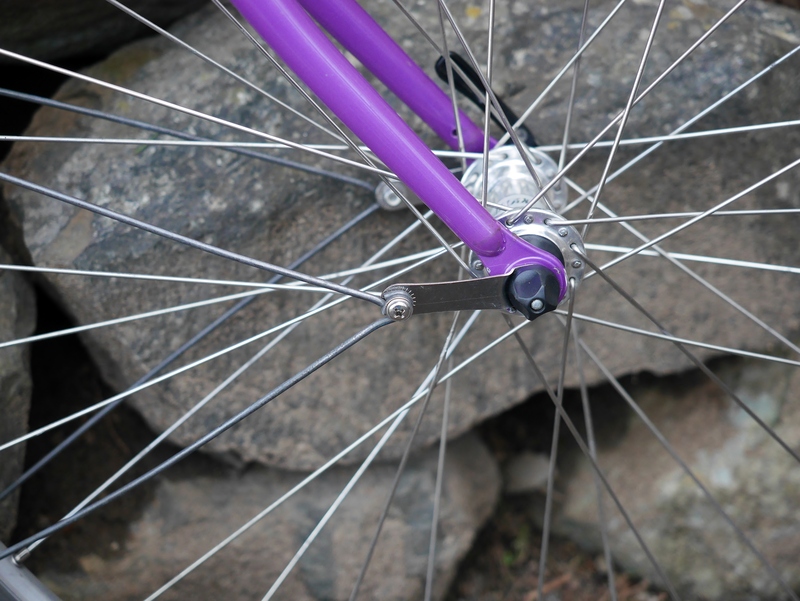 I don’t know if long reach brakes would reach 26″. 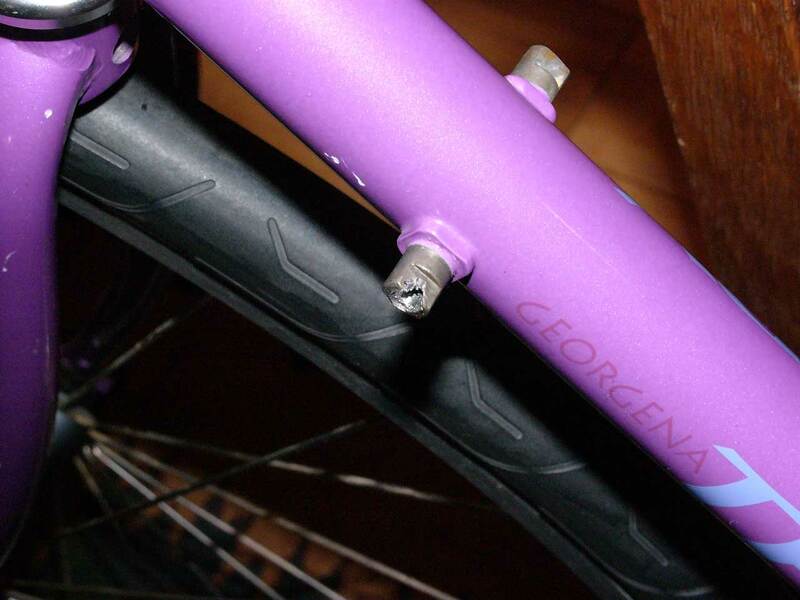 I have an aversion to 26″ wheels because of my surly experience. It has probably biased me for good. I just wish there were more options for 650c tires. 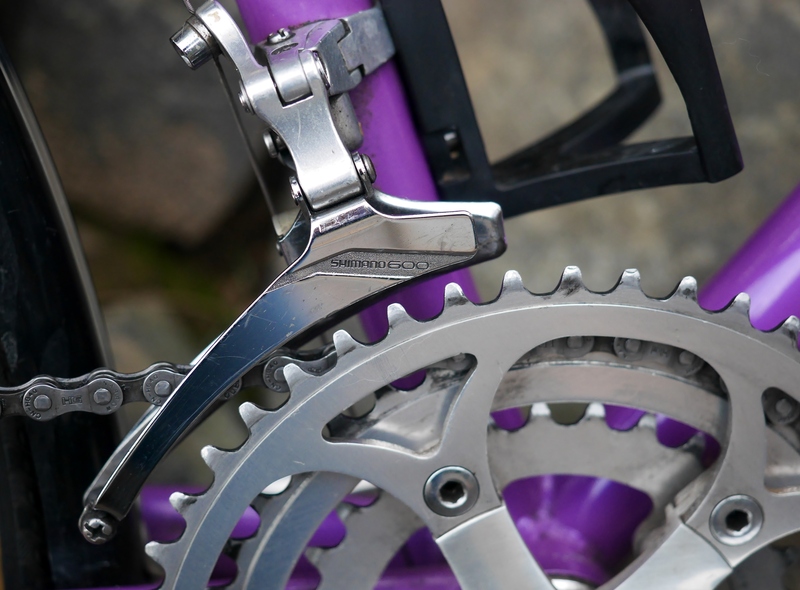 On a fitting note, I recently got a 160mm crank arm crankset on a bicycle and it is amazing! 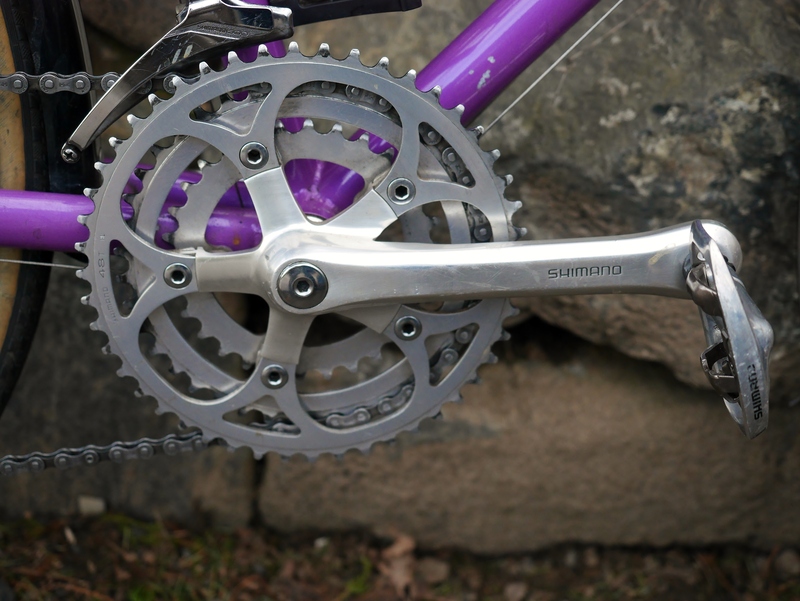 It has made such a difference, and I’ve been riding for decades with 170mm cranks. I highly recommend people try smaller crank arms, if they can find them. 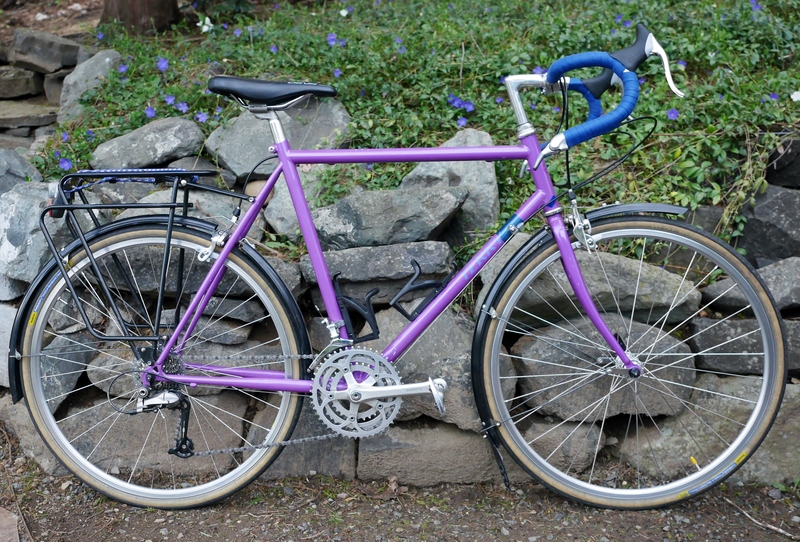 Hi Heather, converting a 700c frame to 559s probably cannot be done, and perhaps should not be done. However I have converted several 700c frames with minimal clearances and minimal BB drop to 650c. Sadly, I still only see 28 cm as the widest tire available in that size. Glad to hear you found some 160 mm crank arms!